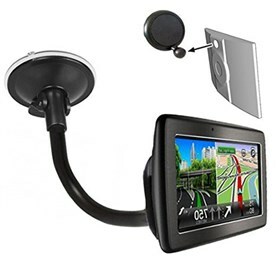 Magellan Gooseneck Windshield Suction Cup Mount for GPS Navigators is a great alternative to windshield mounting your product. This mount has a lot of unique features not found in other mounts. Includes a Gooseneck suction mount & a Ball Adapter. It has a flexible arm which can be adjusted according to one's preferred viewing angle. The Magellan Gooseneck Windshield Suction Cup Mount has many exciting features for users of all types. You can extend the lifetime of your Magellan Gooseneck Windshield Suction Cup Mount with the purchase of a FactoryOutletStore Factory Protection Plan. See the Magellan Gooseneck Windshield Suction Cup Mount gallery images above for more product views. The Magellan Gooseneck Windshield Suction Cup Mount is sold as a Brand New Unopened Item.